ITER is a large scale, international experiment that should demonstrate the scientific and technological feasibility of using fusion as an energy source on earth. ITER will allow the study of plasmas in conditions similar to those expected in a electricity-generating fusion power plant. It will also test a number of key technologies for fusion including the heating, control, diagnostics and remote maintenance that are expected to be needed for a real commercial fusion power station. Extensive information on ITER can be found on the homepage of the ITER-project. ITER started in in 1985 as a collaboration between the then Soviet Union, the European Union (through EURATOM), the USA, and Japan. The current partners in the project are the European Union, Japan, the Russian Federation, China, Korea, India, and the USA, which means that more than half of the global population is represented in the project. ITER will be a machine of the tokamak type in which the fusion plasma is confined by strong magnetic fields (see illustration). The fusion reactor itself has been designed to produce a plasma with 500 MW of thermal output power for 50 MW of net injected power, a plasma power amplification factor of ten (Q=10). Scientifically, this will be the proof of principle that more power can get out of the fusion process than is used to initiate it. Note that no net electricity is produced yet, since the thermal power still has to be converted to electricity and the input power disregards the efficiency of the heating systems. The ITER device: The man in the bottom indicates the scale.The ITER device: The man in the bottom indicates the scale. In June 2005, the partners in the project decided unanimously to choose the European site at Cadarache, in the South of France, as the location for the construction of ITER. The construction of ITER has already started, and the first plasma operation is expected in 2019. ITER is a unique project, which needs very advanced technology, and will ask the utmost from materials, scientific understanding, and international cooperation. For sure, ITER is one of the most complex, challenging and innovative projects in the world today. But it does not end there. 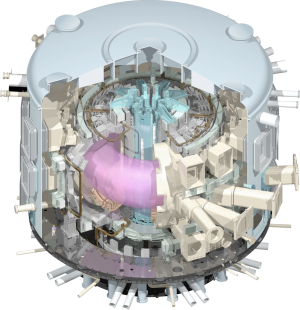 DEMO (DEMOnstration Power Plant) is a proposed fusion power plant that is intended to build upon the expected success of the ITER. It is meant as a model for the first generation of fusion power plants. Read more on fusion power as a source of energy.